Top Cash for Gold, Jewelry, and Coins! 40% off Sterling Silver Sale! The Gold Shop is proud to live up to its name—we’re your local jewelry store and precious metal specialists! Our shop pays cash for gold. Plus we buy and sell gold, silver, platinum, sterling silver, sterling flatware, coins and more. With in-depth industry knowledge, we provide the best prices on sales and purchases. Our friendly, excellent staff is available to help you with any questions you may have. 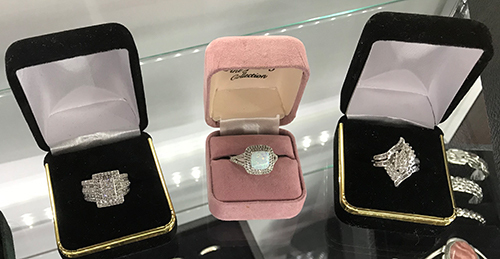 Established in 2010 and locally-owned and -operated, The Gold Shop is the community jewelry store to visit when you want the best deal on precious metals. Known for our great prices, knowledgeable staff and high integrity, we are the premier gold dealer in Laurel, MS. We pay cash for gold and other precious metals. Our services include the purchase and sale of gold, silver, platinum, scrap jewelry, class rings, dental pieces, sterling silver and more. The staff at The Gold Shop brings extensive knowledge of precious metals and pricing to every transaction, to ensure you get the most for your money. We offer discounts based on the type and size of product, and our prices always outshine our competitors! When you need some extra cash, we’re pleased to be the top source for gold buyers in Laurel, MS. We will evaluate your piece, assess its current market value and give you a fair, honest price as well as cash for your gold. When you need a great gift, we also offer a great selection of competitively-priced items. We pride ourselves on our top-level customer service and quality products—we’re knowledgeable about everything we sell and take the time to talk to our customers about their needs and wants. People know they can rely on us to deliver personalized service and great value, every time. Our friendly staff invites you to stop in or call today and see why so many people make The Gold Shop their destination for value. Our business is locally-owned and –operated by friendly, experienced professionals. We’re a family-run business, established in 2010. We take pride in paying more than our competitors and we always offer honest rates. We buy and sell a full range of gold, silver and platinum pieces. We offer great discounts, depending on what you’re buying or selling. Discover unbeatable value at the Gold Shop—your trusted local source for great service, selection and prices on gold, silver, and other precious metals. Call us or stop by today to learn more about our rates and inventory. "Very hornest on prices happy to give you a good deal." February 27, 2017 Mississippi P.
"They have very fair deals."